Edward Paul "Teddy" Sheringham MBE (born 2 April 1966) is an English football manager and player who was the player-manager of Stevenage until he was sacked on 1 February 2016. Sheringham played as a forward, mostly as a second striker, in a 24-year professional career. Sheringham began his career at Millwall, where he scored 111 goals between 1983 and 1991, and is the clubs' second all-time leading scorer. He left to join First Division Nottingham Forest. A year later, Sheringham scored Forest's first ever Premier League goal, and was signed by Tottenham Hotspur. After five seasons at Spurs, Sheringham joined Manchester United where he won three Premier League titles, one FA Cup, one UEFA Champions League, an Intercontinental Cup and an FA Charity Shield. In 2001, he was named both the PFA Players' Player of the Year and FWA Footballer of the Year. The pinnacle of his career came when he scored the equaliser and provided the assist for Manchester United's winning goal in the 1999 UEFA Champions League Final against Bayern Munich. After leaving Manchester United at the end of the 2000–01 season, Sheringham re-joined Tottenham Hotspur, where he was a losing finalist in the 2001–02 Football League Cup. He spent one season at newly promoted Portsmouth, scoring the club's first Premier League goal, before joining West Ham United, where he helped the club gain promotion from the 2004–05 Football League Championship. The following season, Sheringham appeared for West Ham in the 2006 FA Cup Final, becoming the third-oldest player to appear in an FA Cup Final. Sheringham is currently the ninth-highest goalscorer in Premier League history with 147 goals, and is the competition's 19th-highest appearance maker. He holds the record as the oldest outfield player to appear in a Premier League match (40 years, 272 days) and the oldest player to score in a Premier League match (40 years, 268 days). Sheringham was capped 51 times for the England national football team, scoring 11 times. He appeared in the 1998 and 2002 FIFA World Cups, as well as the 1996 UEFA European Championship. Sheringham retired from competitive football at the end of the 2007–08 season with Colchester United, at the age of 42. Having been appointed as the manager of Stevenage in May 2015, he registered himself as a player at the club in November of that year, aged 49. Sheringham began his professional career at Millwall in 1982 at the age of 16, after impressing a scout when playing for non-league club Leytonstone & Ilford during a youth team game against Millwall. He was signed up, initially as an apprentice and scored on only his second appearance for the club in a match away at Bournemouth in January 1984. After being loaned out by the club twice in 1985 to Aldershot and later a Swedish side, Djurgården, he quickly became a first choice selection at Millwall and during the late 1980s formed a striking partnership with Tony Cascarino. He was the club's top goalscorer in four seasons (1986–87, 1987–88, 1988–89 and 1990–91) and played in every game of the season twice, in 1986–87 and 1990–91. In their three seasons together at Millwall, Cascarino and Sheringham scored 99 goals between them. The 1987–88 season saw the club promoted to the First Division, then the highest tier of English league football, for the first time. Sheringham scored the first goal in Millwall's first home game in Division One. Millwall briefly topped the table at the start of October 1988 and the goals of Sheringham (15) and Cascarino (15) kept Millwall in the top four for most of the season before fading after Easter to finish in 10th position. Sheringham said in his autobiography: "It was a crazy exhilarating time. There we were, little Millwall, in our first season in the First Division and topping the table until about March. Everybody said it couldn't last and of course it couldn't and it didn't, but we gave them all a good run for their money. We were beating the best teams when we shouldn't and getting away draws to which we had no right." Millwall's spell in the top flight was not to last as they were relegated in the following season, finishing bottom of the Division after briefly topping the table again early in the season. Sheringham was again top scorer for Millwall with twelve goals, having missed ten league games through injury. The club had an opportunity to bounce straight back up at the end of the 1990–91 season, reaching the semi-finals of the Division Two play-offs, but they were beaten by Brighton & Hove Albion and remained in the Second Division. Sheringham's outstanding form during the 1990–91 season saw him finish as the league's highest scorer with 37 goals, a haul which included four hat-tricks. With Millwall failing to return to the top flight, a departure for Sheringham looked inevitable. 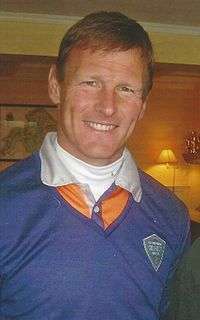 In his final season at Millwall, Sheringham broke all of the club's goalscoring records, scoring a total of 111 goals in all competitions in his eight years at the club. He was Millwall's all-time leading scorer until 2009. The 25-year-old Sheringham was sold to Nottingham Forest in a £2 million deal in July 1991 to play alongside Nigel Clough. He did well for Forest and helped them finish eighth in the First Division at the end of the 1991–92 season as well as to reach the League Cup final, where they lost to Manchester United. Sheringham scored Forest's first Premiership goal against Liverpool in August 1992 (which was also the first ever live goal shown on Sky Sports) but a week later he was sold to Tottenham Hotspur for £2.1 million. Forest went on to be relegated in 1992–93, having failed to adequately replace Sheringham in attack. Sheringham had a successful start to his career at the club by being the Premier League's top goalscorer in its inaugural season, scoring 22 goals (21 with Tottenham and one with Forest). His strike partners at White Hart Lane included Gordon Durie, Ronny Rosenthal, Jürgen Klinsmann and finally Chris Armstrong. In 1993–94, he was Tottenham's top scorer with 14 Premiership goals but played in just 19 games due to injury and this impacted negatively on Tottenham's league form. Spurs finished 15th and were not completely safe from relegation until the penultimate game of the season. They have not finished lower than this ever since. The following season was better, as he helped Spurs finish seventh in the Premiership and reach the semi-final of the FA Cup, just missing out on European football for the 1995–96 season. Jürgen Klinsmann, who partnered Sheringham during the 1994–95 season, was later quoted as claiming that Sheringham was the most intelligent strike partner he had ever had. Sheringham was hugely popular with the Tottenham fans and by the mid-1990s was firmly established as one of the most highly rated strikers in the Premiership. However, despite his prolific strike rate by the end of the 1996–97 season he was 31 years old and had yet to win a major trophy in a career which had so far spanned 15 years; many pundits considered him past his best and likely to finish his career without major honours. In June 1997, Sheringham agreed to join Manchester United in a £3.5 million deal. He was signed to replace the iconic Eric Cantona whose retirement had left the Old Trafford faithful demanding a big name to fill the gap. His first competitive game for the club was against his former employers, Tottenham, at White Hart Lane. 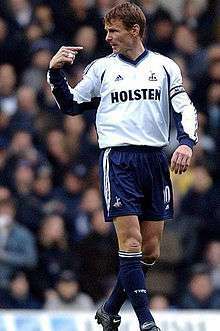 Throughout the game, Sheringham suffered jeers and boos from his former fans, who had been angered by the fact that Sheringham had accused Tottenham of lacking ambition when he made his transfer. In the 60th minute with the score at 0–0, Sheringham missed a penalty, although ended up on the winning side as two late goals gave United the win. Sheringham's first season at Old Trafford was difficult, although he scored 14 goals in all competitions he failed to meet expectations as the 1997–98 season ended without a trophy. Towards the end of the season, during a game at Bolton Wanderers, an incident occurred that furthered the animosity with fellow striker Andy Cole. When Bolton scored, Sheringham blamed Cole, his strike partner and Cole then refused to talk to him. The breakdown in their relationship was never resolved, and reputedly they never spoke again. This had started three years previously in 1995 when Sheringham had snubbed Cole as the latter came on to make his international debut. Speculation that Sheringham would leave United increased just after the 1998–99 season got underway, when Dwight Yorke moved to Old Trafford from Aston Villa. Yorke immediately formed a prolific partnership with Cole as United went on to regain the Premier League title on the final day of the season. Sheringham's first-team chances were relatively limited but he still managed to make enough appearances to qualify for a championship medal at the end of the season – at the age of 33 he had won his first major trophy. A week later he came off the substitutes bench to score United's opening goal in a 2–0 defeat of Newcastle United the FA Cup final to secure the double. Four days after the FA Cup triumph, Sheringham scored a dramatic stoppage-time equaliser against Bayern Munich in the Champions League final, having come on as a substitute earlier in the game. With seconds of stoppage-time remaining, Ole Gunnar Solskjær scored from Sheringham's headed flick-on, and United won a treble of the Premiership, FA Cup and European Cup with Sheringham – having not won a major honour in his 15-year career on leaving Spurs – now having won every top-level trophy in the English game. Sheringham's first-team chances remained limited during 1999–2000, but he still played enough times to merit another Premiership title medal. In 2000–01, United secured a third consecutive league title, with Sheringham top-scoring for United and playing some of the best football of his career. In April 2001, he was voted Footballer of the Year by both the Professional Footballers' Association and Football Writers' Association. His fine form ensured that he was still involved with the national side despite being in his 35th year, being named in the squad for the 2002 World Cup. At the end of the 2000–01 season, Sheringham's four-year contract at Old Trafford expired. He was facing stiffer competition than ever for the places up front, most of all from United's new Dutch striker Ruud van Nistelrooy. He refused United's offer of a 12-month contract and returned to Tottenham on a free transfer as one of new manager Glenn Hoddle's first signings. In his first season back, Sheringham helped Tottenham to a ninth-place finish, the club's highest in 6 years, and to reach the League Cup final where they lost 2–1 to Blackburn Rovers, with Sheringham being brought down in the penalty area in the last minute for what he believed to be a penalty. 2002–03 brought a similar mid table finish, although Tottenham had topped the Premiership three games into the season. Sheringham made 80 appearances in all competitions for Tottenham in this period, scoring 26 goals. Sheringham and Clive Allen were inducted into the Tottenham Hotspur Hall of Fame on 8 May 2008. On the expiry of his Tottenham contract at the end of the 2002–03 season, Tottenham decided not to offer Sheringham a new contract and he joined Portsmouth in their first season in the Premier League. Sheringham became the oldest Premiership player to score a hat-trick when he scored three against Bolton early in the season. Despite this, he was only contracted to the club for one season and, despite scoring in his final game (a 5–1 win victory over Middlesbrough with the club already secure in the top flight), at the end of the 2003–04 season, Portsmouth decided not to offer the 38-year-old striker another contract but he insisted that he wanted to continue his top flight career at another club. Sheringham made 38 appearances for Portsmouth, scoring ten goals. Teddy Sheringham as a West Ham United player and coach. Sheringham then dropped down a division to West Ham United in the Football League Championship, and was the division's third-highest goalscorer with 20 goals (21 in all competitions) – one of the highest scoring seasons of his career. He won the Championship Player of the Season award, and helped the Hammers reach the 2005 Football League Championship play-off Final where they beat Preston North End to return to the Premiership after two seasons in the Football League. At the end of the 2004–05 season, Sheringham's one-year contract expired and he agreed to sign on for another season, this time back in the Premiership, at Upton Park. 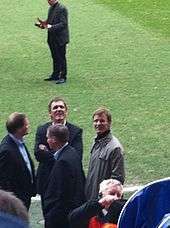 After a second-half appearance against Charlton Athletic on 2 April 2006, Sheringham joined a small group of footballers, including Les Sealey, John Burridge and Gordon Strachan, who have played top-flight football while in their forties. On 19 August 2006, he became the oldest outfield player in the history of the division, at 40 years 139 days. 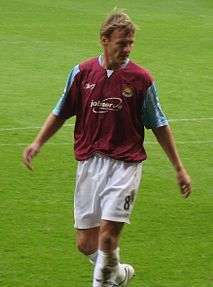 Sheringham signed a contract to play for West Ham until the end of the 2006–07 season, and was a player at the club after his 41st birthday. On 13 May 2006, Sheringham became the third oldest player to appear in an FA Cup final, at 40 years and 41 days old. The game ended 3–3, with Liverpool winning the trophy in a penalty shootout. Sheringham was the only West Ham player to convert his kick as Liverpool won the shootout 3–1. On 26 December 2006, at the age of 40 years and 266 days, he beat his own record for oldest Premiership scorer, with the goal in a 2–1 defeat to Portsmouth. On 30 December 2006 he broke the record for oldest Premiership outfield player once more, starting in the 1–0 defeat against Manchester City, aged 40 years and 270 days. Sheringham also appeared in 11 FA Cup, League Cup, and UEFA Cup games for West Ham, scoring two goals. After being released by West Ham, Sheringham signed for Colchester United in July 2007 and was given the number 8 shirt. He started Colchester's first game of the season, away at Sheffield United, and scored the first goal in a 2–2 home draw against Barnsley a week later. 7 days later he scored again, in a 3–0 win at Preston North End. Having just served a three match suspension after being sent off against Coventry, Sheringham was once again amongst the scorers in Colchester's 2–1 win at Hillsborough over Sheffield Wednesday. He scored his fourth and final Colchester goal in a 3–1 FA Cup defeat to Peterborough United on 5 January 2008. Sheringham made only 3 league appearances in 2008, the last of which came against Stoke City on 26 April 2008, the last ever game at Layer Road. Whilst at Colchester, Sheringham was the oldest player in all four divisions of the Football League, and is now part of the elite list of players who have achieved more than 700 League appearances in their career. He retired at the end of the 2007–08 season, his career ending on a low note as Colchester were relegated from the Championship – the club's first relegation for 18 years. Something of a late developer on the international scene, Sheringham did not win his first England cap until the age of 27 in 1993. 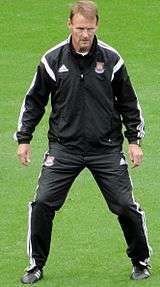 Under the reign of manager Terry Venables (1994–96) Sheringham came to be the preferred strike partner for Alan Shearer. During this time, England had a wealth of strikers with the likes of Andrew Cole, Ian Wright, a young Robbie Fowler and Les Ferdinand all battling to partner Shearer in the England team. The two formed a famous partnership at international level, as they complemented each other's strengths: Shearer the out-and-out goalscorer, big, strong and powerful, Sheringham just 'dropping off' his strike partner, finding spaces, creating play and providing key passes, forming the link between Shearer and the England midfield. The pairing came to be known as 'The SAS' ('Shearer and Sheringham') and their most successful time together came in the 1996 European Championships, held in England. Their most famous contribution was in the 4–1 victory over the Netherlands, a game in the opening group stages in which they both scored twice against one of the strongest teams in the tournament. 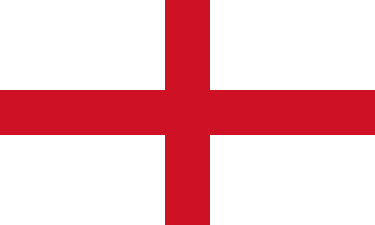 Though England were eventually knocked out in the semi-finals, many believed that that squad of players such as Sheringham and his contemporaries including Paul Gascoigne, Steve McManaman, Tony Adams and Paul Ince, had done the nation proud. Unfortunately, the England squad were also criticised heavily in the media for their part in several off the field incidents during the lead up to the tournament, where Sheringham, McManaman and Gascoigne were photographed drinking heavily and playing "dentist chair" drinking games as well as destroying the first class cabin of a Cathay Pacific flight, which went down poorly with the public. Sheringham continued to be a first choice selection under new England manager Glenn Hoddle (1996–99) until the emergence of new teenage superstar Michael Owen during the course of 1998 saw him overshadowed. Although Sheringham began the 1998 FIFA World Cup as a starting player with Owen on the bench, after Owen replaced him and almost turned around a defeat against Romania in England's second game of the tournament, it seemed likely that Sheringham's front line international career had come to an end. He was not selected at all for the 2000 European Championships by then manager Kevin Keegan, but the retirement of Shearer (despite being four years younger than Sheringham) from international football after that tournament and the arrival of new manager Sven-Göran Eriksson in 2001 saw a return to international favour for him. He was often deployed as a tactical substitute late in games by Eriksson, valued for his ability to hold the ball up and create intelligent play. 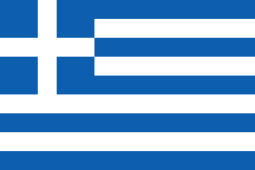 In 2001, Sheringham scored an important goal for England against Greece in a World Cup qualifying match within 15 seconds of coming on as a substitute, although this event is overlooked by the 93rd minute equalising free-kick by David Beckham. He was selected as part of Eriksson's 2002 FIFA World Cup squad after impressing throughout the 01–02 season with his club, and played in the famous 1–0 win against Argentina, almost scoring a goal with a volley that was well saved by the Argentine goalkeeper, and made his final England appearance as a substitute in the 2–1 quarter-final defeat to Brazil in Japan. His twelve appearances for Eriksson were all as a substitute. At the age of 36, that defeat signalled the final end of Sheringham's international career, during which he had earned fifty-one caps and scored eleven times for England. Upon his retirement from professional football in 2008, Sheringham has been a noticeable figure on the world poker scene, playing in various competitions worldwide. He made the final table in the €5,000 No Limit Hold'em Main Event in the EPT Vilamoura, finishing 5th out of a field of 384 players, winning €93,121. In May 2014, Sheringham was appointed as an attacking coach with West Ham United. He was credited with a change in West Ham's style of play which led to a run of good form at the start of the 2014–15 season, earning striker Diafra Sakho the Premier League Player of the Month award for October 2014. On 21 May 2015, Sheringham was appointed to his first managerial role, taking charge of League Two side Stevenage, replacing Graham Westley. He was sacked on 1 February 2016, with the club 19th in the league having collected only three points from their last eight matches. As of match played 30 January 2016. With his then long-term partner Denise Simms, Sheringham is the father of non-league footballer striker Charlie Sheringham. After his relationship with Simms ended in 1992, Sheringham dated models Katie Price, Nicola Smith (sister of Mandy Smith), and Danielle Lloyd. A versatile forward, Sheringham was capable of playing both as a striker and as a supporting forward, due to his ability to score and create goals. Due to his vision, his ability to read the game, and his short passing ability, Sheringham was capable of playing off another striker, in a deeper, creative role, where he served as an assist provider, in particular in later years, as he lost pace and stamina. He also possessed good technical ability and upper body strength, which allowed him to retain possession in the box when playing with his back to goal, and lay off the ball for his team mates. As a centre-forward in his prime, he was also very effective and extremely prolific, due to his accurate finishing, opportunism in the area, intelligence, and his ability in the air, which enabled him to be regarded as one of the top Premier League forwards of his generation. ↑ "Teddy Sheringham". Soccerbase. Retrieved 30 July 2013. ↑ "20 years on: The Premier League then & now". Goal.com. Retrieved 30 July 2013. ↑ "Pompey 2 Aston Villa 1". The News. 16 August 2003. Retrieved 30 July 2013. ↑ "Sheringham can add sting in the tale". The Telegraph. 12 May 2006. Retrieved 30 July 2013. ↑ "Players Index". Premier League. Retrieved 30 July 2013. ↑ "Premier League dad's army: top division's oldest outfield players, in pictures". The Telegraph. Retrieved 30 July 2013. ↑ "Goal-den oldies: Kevin Phillips becomes the latest Premier League veteran to hit the net". Daily Mail. 9 February 2010. Retrieved 30 July 2013. ↑ "Sheringham to call time on career". BBC Sport. British Broadcasting Corporation. 1 March 2008. Retrieved 2 March 2008. ↑ "Teddy Sheringham registers to play for Stevenage age 49". 3 November 2015. ↑ "Teddy Sheringham". The Millwall History Files. Retrieved 24 June 2007. ↑ "Top Goal Scorers". Millwall History. Retrieved 28 August 2010. ↑ "Results 88–89". The Millwall History Files. Retrieved 27 August 2007. ↑ Sheringham, Teddy (1998). Teddy. London: Little, Brown and Company. ISBN 0-7515-2844-7. ↑ "Results 89–90". The Millwall History Files. Retrieved 27 August 2007. ↑ "Results 90–91". The Millwall Hall of Fame. Retrieved 27 August 2007. ↑ "Results 88–89". The Millwall History Files. Retrieved 30 January 2011. 1 2 3 4 "Teddy Sheringham". Soccerbase. Racing Post. Retrieved 27 August 2007. ↑ "Klinsmann So Sweet On Sheri". 4thegame. 10 January 1998. Retrieved 27 September 2007. ↑ Nixon, Alan (28 June 1997). "United capture Sheringham". The Independent. Independent Print Limited. Retrieved 2 April 2012. ↑ Taylor, Daniel (19 February 2000). "Sheringham smouldering for success". London: The Guardian. Retrieved 27 April 2008. ↑ "'I've loathed Sheringham for 15 years' reveals Cole". Irish Independent. 4 March 2010. Retrieved 5 March 2011. ↑ Mallam, C. (23 May 1999). "FA Cup Final: Sheringham and Scholes make victory look easy". London: Telegraph. Archived from the original on 14 October 2007. Retrieved 27 September 2007. ↑ Sheringham, Teddy (26 May 2009). "Manchester United's moment of magic that completed an historic treble". The Guardian. Retrieved 31 May 2014. ↑ Webster, Rupert. "SUCCESS IS SWEET AS SHERI FOR TEDDY". Sky Sports. ↑ "Sheringham scoops writers' award", BBC Sport, 20 April 2001. Retrieved 27 June 2007. ↑ "Sheringham wins second award", BBC Sport, 29 April 2001. Retrieved 27 June 2007. ↑ "Ferguson: Sheringham right to quit", BBC Sport, 5 March 2002. Retrieved 29 June 2007. ↑ "Sheringham seals Spurs return", BBC Sport, 26 May 2001. Retrieved 27 June 2007. ↑ "Cole strike stuns Spurs", BBC Sport, 24 February 2002. Retrieved 27 June 2007. ↑ Soccerbase: Teddy Sheringham, Racing Post. Retrieved 27 June 2007. ↑ "News Archive - tottenhamhotspur.com". tottenhamhotspur.com. ↑ "Sheringham left 'disappointed'", BBC Sport, 8 May 2003. Retrieved 25 June 2007. ↑ "Sheringham signs for Pompey", BBC Sports, 30 June 2003. Retrieved 25 June 2007. ↑ Portsmouth top Premier League, BBC Sport, 26 August 2003. Retrieved 16 February 2011. ↑ "Portsmouth 5–1 Middlesbrough', BBC Sport, BBC, 15 May 2004. Retrieved 16 February 2011. ↑ "Sheringham exit confirmed", BBC Sport, 13 May 2004. Retrieved 25 June 2007. ↑ "Sheringham joins West Ham". BBC Sport. British Broadcasting Corporation. 14 July 2004. Retrieved 26 June 2007. ↑ "Championship award for Sheringham". BBC Sport. British Broadcasting Corporation. 17 May 2005. Retrieved 1 March 2008. ↑ "Sheringham re-signs for Hammers". BBC Sport. British Broadcasting Corporation. 11 June 2005. Retrieved 1 March 2008. ↑ "West Ham 0–0 Charlton". BBC Sport. British Broadcasting Corporation. 2 June 2004. Retrieved 1 March 2008. ↑ Harlow, Phil (19 August 2006). "West Ham 3–1 Charlton". BBC Sport. British Broadcasting Corporation. Retrieved 1 March 2008. ↑ "West Ham extend Sheringham's deal". BBC Sport. British Broadcasting Corporation. 6 March 2006. Retrieved 1 March 2008. ↑ "Sheringham switches to Colchester". BBC Sport. British Broadcasting Corporation. 4 July 2007. Retrieved 4 July 2007. ↑ "Sheff Utd 2–2 Colchester". BBC Sport. British Broadcasting Corporation. 11 August 2007. Retrieved 20 August 2007. ↑ "Colchester 2–2 Barnsley". BBC Sport. British Broadcasting Corporation. 18 August 2007. Retrieved 20 August 2007. ↑ "Preston 0–3 Colchester". BBC. 25 August 2007. Retrieved 5 November 2009. ↑ "Sheff Wed 1–2 Colchester". BBC. 1 December 2007. Retrieved 5 November 2009. ↑ "Colchester 1–3 Peterborough". BBC. 5 January 2008. Retrieved 5 November 2009. ↑ "Colchester 0–1 Stoke". BBC. 26 April 2008. Retrieved 21 March 2010. ↑ "Sheringham announces retirement". BBC Sport. British Broadcasting Corporation. 1 March 2008. Retrieved 1 March 2008. ↑ "England Players by Number of Appearances Under Sven-Göran Eriksson". englandfootballonline.com. ↑ "Teddy Sheringham". Soccerbase. Retrieved 3 October 2014. 1 2 "Teddy Sheringham". Premier League. Retrieved 3 October 2014. 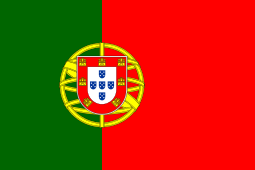 ↑ "EPT - 7 - Vilamoura, No Limit Hold'em - EPT Main Event: Hendon Mob Poker Database". thehendonmob.com. ↑ "Teddy Sheringham returns to West Ham as attacking coach". BBC Sport. 30 May 2014. Retrieved 31 May 2014. ↑ "West Ham: Awards for Sam Allardyce & Diafra Sakho". BBC Sport. 7 November 2014. Retrieved 7 November 2014. ↑ "Teddy Sheringham: Stevenage name ex-England striker as boss". BBC Sport. 21 May 2015. Retrieved 21 May 2015. ↑ "Teddy Sheringham sacked by Stevenage after poor run". The Guardian. 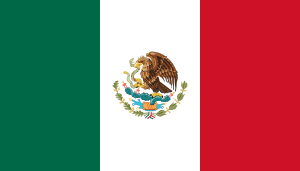 1 February 2016. Retrieved 9 February 2016. ↑ "Managers: Teddy Sheringham". Soccerbase. Centurycomm. Retrieved 9 June 2016. ↑ Lara Gould (25 July 2009). "Footballer Teddy Sheringham sets up home with blonde 20 years his junior". mirror. ↑ "Teddy Sheringham". Millwall History. Retrieved 3 October 2014. 1 2 3 "Premier League icons - Teddy Sheringham". Total Football Mag. Retrieved 3 October 2014. 1 2 3 "England Players — Teddy Sheringham". England Football Online. Retrieved 3 October 2014. ↑ "Rooney wins club award treble". ManUtd.com. 4 May 2010. Retrieved 21 October 2014. ↑ "Teddy Sheringham returns to West Ham as attacking coach". BBC Sport. 30 May 2014. Retrieved 21 October 2014. ↑ "Spurs Legends Honoured". Tottenhamhotspur.com. 20 July 2009. Retrieved 21 October 2014. ↑ "Teddy Sheringham joins West Ham as Sam Allardyce names former striker as attacking coach". The Daily Mail. Retrieved 18 December 2014. 1 2 "Teddy Sheringham". Retrieved 18 December 2014. 1 2 "Shed no tears for Teddy". The Telegraph. Retrieved 18 December 2014. ↑ "100 club: The most prolific scorers in the Premier League: Teddy Sheringham, 147 goals". The Independent. Retrieved 18 December 2014. 1 2 "Rickie Lambert will be Liverpool's Teddy Sheringham". Retrieved 18 December 2014. ↑ "Sheringham to coach at West Ham". ESPN FC. Retrieved 18 December 2014. ↑ "Sheringham 'excited' by return to West Ham". PremierLeague.com. Retrieved 18 December 2014. Teddy on "Life at 40"